kidslooklikekats: The Fiery Furnaces - "Bitter Tea"
It is 72° out, mid-march, approximately 21 hours past the hour I was born 25 years ago. All that to say I am happy, and ready to get up from in front of this computer screen. 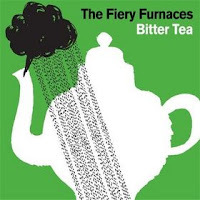 But before I do that, let me say this...The Fiery Furnaces are becoming a new favorite. I will warn anyone interested in listening (with no previous introduction to their music) right now - do not judge this album based on your first listen!! This is another one of those ease-your-way-in, "oh...i get it" kind of albums and groups. Upon first skeptical listen, you may very likely be annoyed with the cut-and-paste song structures consuming most of the tracks from start to finish, as well as the high-pitched, "Mom! My robot is taking over the city again!!" keyboard/clavichord/electrical cord combination of sounds that quite literally explode in and out of existence. Your eardrums will hate you at first, but you know what, if you are like me (e.g. one who appreciates artistic musical endeavor, stylized music, and walking as opposed to jogging), they'll get over it and get used to it, and probably like it, and then love it (possibly). It is all a matter of taste, honestly. I thoroughly enjoy the track "I'm In No Mood", with its tinker-toy piano and whimsically moody subject matter, "I'm in no mood to comb my hair, there's a chill in the air, and it's catching! catching! ", as well as the sudden change of pace and mood as is The Fiery Furnace's signature in sound. Nothing classic here, but it definitely has originality and flare. A for originality (there is too an "A" in originality...).